About Map: Map showing location of Suriname in the World. 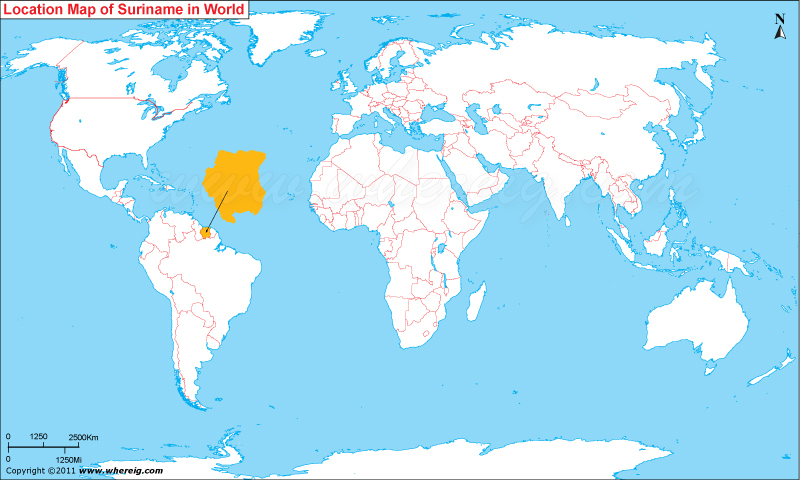 The given Suriname location map shows that Suriname is located in the northern part of South America. Suriname map also shows that it shares its international boundaries with French Guiana in the east, Brazil in the south and Guyana in the west. Besides, Atlantic Ocean lies in the north. Suriname is the smallest sovereign state of South America and Paramaribo is the capital and largest city of the country. The large chunk of people lives in and around the capital city Paramaribo. The government type of Suriname is a parliamentary representative democratic republic featured with multi-party system. Under this system, the President of Suriname is the head of government. Moreover, the economy of the country is largely depends upon mining and agriculture. The bauxite industry alone accounts more than 15% of GDP and 70% of export revenue. Besides, Suriname also exports rice, bananas, and shrimp.